The What: The NewTek IP Series is a software-driven, modular video production system with virtually limitless access to video sources and video mixing options, according to the company. Designed to work cohesively in an ecosystem, the NewTek IP Series is the first large production system designed for IP video while also fully backwards compatible with SDI; using separate scalable high-performance components for the mixing and control, input, and output of sources. Video, audio, and control signals from these components are transferred digitally using NewTek’s Network Device Interface (NDI) technology, allowing multiple video systems to identify and communicate with any other system over a standard computer network. The result is a fully customizable IP workflow solution flexible enough to handle demanding production needs. The What Else: With the NewTek IP Series, current and future resources can be integrated through an interconnected production workflow using commercial-off-the-shelf network infrastructure. The nucleus of the NewTek IP Series is the NewTek VMC1 video mix engine capable of switching up 64 source channels, including 44 external inputs (each with key and fill) and full mixing control with 8 M/Es with full re-entry, plus PREVIZ. Each video mix engine includes integrated compositing, a sophisticated macro automation engine, and a flexible and scalable effects system available with almost unlimited matting, DVE, transitions, overlays, virtual sets, and real-time data. Multiple NewTek VMC1’s can be placed on the network allowing for both expansion and full redundancy as needed. The NewTek VMC1 4S control panel is the tactile interface that connects the operator to single or multiple engines for precise control of the production. Paired with the VMC1 over a network, the NewTek VMC1 4S control panel offers comprehensive functionality with four independently assignable stripes and premium hardware mechanics that are intuitively arranged and ergonomically designed. 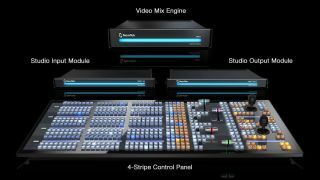 The Bottom Line: The NewTek VMC1 video mix engine, NewTek VMC1 4S 4-Stripe control panel , and the NewTek VMC1 IN Studio input module are available immediately. The NewTek VMC1 OUT Studio output module will be available in Q4 2016.